SUMMIT's selection of built-in undercounter refrigeration includes uniquely sized 15" wide units for a slim fit with user-friendly convenience. 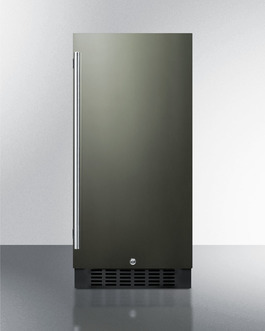 The FF1532BKS is a frost-free all-refrigerator in a slim 15" width. The front-breathing system allows built-in installation, while the fully finished black cabinet also allows freestanding use. This unit features our new black stainless steel finish from our exclusive basalt collection. The wrapped door is made from 304 grade stainless steel with a high gloss finish in a neutral hue to perfectly accent or complement your kitchen design. The door is strongly resistant to most fingerprints and can easily be wiped clean with a dry cloth. A side-mounted handle in brushed stainless steel completes the look. The user-reversible door includes a factory installed lock for added security. Inside, the FF1532BKS includes adjustable glass shelves for easy storage. Two door shelves are perfect for holding beverages and condiments, while the floor is specially slotted to store wine bottles. LED lighting provides an attractive presentation inside the 3 cu.ft. interior. The digital thermostat features a readout in Celsius or Fahrenheit for easy and intuitive temperature control. This unit is ETL-S listed to NSF-7 commercial standards. With ideal dimensions and advanced product features, the FF1532BKS is the perfect choice for unique kitchen spaces. This unit can be paired with the matching SCFF1533BKS all-freezer as a side-by-side set or combined with our StackRack.